As a schoolboy, Peig Sayers were the bane of my life. Her books were part of the reading list on the Irish-language courses. And until I spent the summer of 1966 in Ballinskelligs in the Kerry Gaeltacht, I was on course to fail the ‘Inter Cert’ exams in Irish – and so I was on course too to failing the full exams and to finding myself on the way to school in England. I cannot blame my negative teenage views of the Irish language on Peig Sayers … but she did nothing to leave me with a positive view of a language that was foreign to me, despite an increasing interest in the Irish language at the time of the fiftieth anniversary of the 1916 Rising. Anyone of my age who was a schoolboy in Ireland in the 1950s and the 1960s has memories of Peig Sayers (1873-1958) and her autobiographical memoir Peig. It was only later in life that I learned that she never wrote the book, and that she dictated her reminiscences to others, who redacted and edited them. Her book Peig depicts the declining years of a traditional, Irish-speaking way of life characterised by poverty, devout Roman Catholicism, and folk memories of gang violence, the Great Famine, and the Penal Laws. 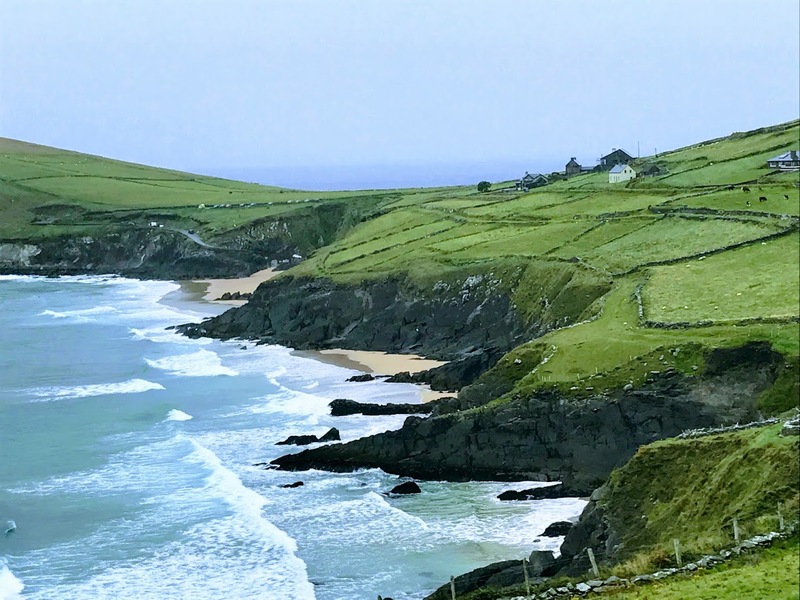 The other Blasket islanders we were expected to read, or to know about, included Muiris Ó Súilleabháin, author of the autobiographical Fiche Blian ag Fás (Twenty Years a-Growing), and Tomás Ó Criomhthain, who wrote An tOileánach (‘The Islandman,’ 1929), satirised by Flann O’Brien as An Béal Bocht (‘The Poor Mouth’). But as we headed out the Dingle Peninsula last week, we were reminded that Peig was neither from the Blasket Islands, nor did she die there. She was born in Vicarstown, Dunquin, she was educated in English, she was illiterate in Irish, she spent her first working years in Dingle, and she was only in her mid-50s when the stories in Peig were recorded by Robin Flower, who gave her the voice of an old and dying woman. I was surprised to realise that she was still alive when I was born. By the time she actually had ‘one foot in the grave and the other on its edge,’ she was living in a nursing home in Dingle, where she died at the end of 1958, when I was almost 7, and she was buried not on the Blasket Islands but on the mainland in Dunquin. Freed from the myths about Peig Sayers and memories of her morose memoirs, I was able to have a fresh view of the Blasket Islands and Dunquin last week. Indeed, the Blaskets have always been an intrinsic part of Dunquin. The Great Blasket was always known simply as the Island, or the Western Island, or the Great Island, while the other islands were the Lesser Blaskets. From the end of the 13th century, the Ferriter family leased the islands from the Earls of Desmond, and from Sir Richard Boyle after the dispossession of the Desmond Geraldines at the end of the 16th century. The last of the Ferriters on the Blasket Islands was the poet and rebel Captain Pierce Ferriter who hanged in Killarney in 1653. However, Charles Smith, author of The Ancient and the Present State of the County of Kerry (1756), claimed the Great Blasket was not inhabited, except by ancient monks, before 1710. The population of the Island grew with the influx of tenants evicted from their holdings by Lord Ventry in the first half of the 19th century. By 1840, the population of the Island estimated at 150. The stones of the Ferriter castle were used to build a Church of Ireland school in 1840, but this school closed in 1852 when the population of the island fell dramatically after the Great Famine. Another Famine hit the island in 1878-1879. At the time, the Earl of Cork was the landlord of the Islands and much of the mainland. Richard Edmund St Lawrence Boyle (1829–1904), 9th Earl of Cork, supplied Champion and Black seed potatoes free to all his tenants in 1880. The Congested Districts Board bought the island in 1907, and the population is said to have reached its peak in 1916 at 176, although the maximum number of houses on the island was never more than 30. Visitors to the island from the early 20th century included the playwright John Millington Synge, who first visited the Blaskets in 1905, the Norwegian linguist Carl Marstrander, who visited in 1907 and was called ‘the Viking’ by the islanders, and the Celtic scholar Robin Flower, who first visited in 1910. Others included George Derwent Thomson, the great Greek scholar, and Kenneth Jackson, the Celtic scholar. Island life had been a constant struggle and the population began to decline in the early 1930s. Finally, in 1953-1954, the islanders abandoned the Blasket Islands. The former Taoiseach Charlie Haughey bought Inishvickillane, one of the Blasket Islands, for £25,000 in 1974. His few guests there included President Francois Mitterrand, in whose honour a French flag was raised on the island in 1988. Whatever happens to Inishvickillane may still be an open question. But, for me, Peig Sayers remains a closed book. Thank you for this entry. Being an American in Dublin, I read Peig in English, as well as many other books on the same theme. ( I struggled to finish Twenty Years A Growing.) I was a newcomer to Ireland in 1968 and 44 years later we moved to Seattle. I still pine for all things Irish.